Matt has been a managing shareholder of the firm for over 15 years and his practice covers a broad range of domestic and international IP matters in mechanical and electro-mechanical technologies. His practice covers a broad range of domestic and international IP matters in mechanical and electro-mechanical technologies. Co-author of "Cases and Materials on Patent Law: Including Trade Secrets, Copyrights, Trademarks," sixth edition, West Publishing Co.
Matt has been a managing shareholder of the firm for over 15 years and his practice covers a broad range of domestic and international IP matters in mechanical and electro-mechanical technologies. His expertise includes patent portfolio management and counseling for some of the world’s most innovative multinational enterprises, as well as litigation, infringement and clearance opinions, and licensing and joint development agreements. Matt also is a coauthor of the law school textbook Cases and Materials on Patent Law: Including Trade Secrets, which is part of the American Casebook Series published by West Academic Publishing. He received his Juris Doctor degree from Wayne State University Law School, and also has earned a Bachelor of Science in Mechanical Engineering with a minor in Mathematics. While earning these degrees, he was president of the student chapter of the National Society of Professional Engineers and a member of Tau Beta Pi, an honorary engineering society. 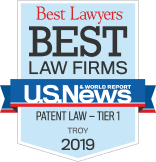 Matt is currently a member of the Michigan State Bar and admitted in various U.S. District Courts, the Court of Appeals for the Federal Circuit and the U.S. Supreme Court. Outside of the office, Matt enjoys spending time with his family, playing golf and traveling.